I hope this email finds you all well and wonderful. It seems like such a long time since I have shared with you all. Much has been going on in my life- abundance, flow and deep enjoyment of all things that are arising. This spring was filled with travel and teaching- We completed the first Yoga Wellness Professional Course- and finished it off with an intensive in beautiful California- you can see pictures here, and I recently returned from a well deserved rest in Hawaii. The world and life continues to move quickly around me, yet there is a sense of peace and calm that I am embracing in my life and my practice. Joy seems to be a current running through my mind and being these days- and of course gratitude for all and everything around me. I am looking forward to sharing more with you all, and the world as a whole in the time to come. We will be offering the Yoga Wellness Pro course again this September, its an amazing experience whether for personal growth or for sharing with your community. I hope to also be announcing another session of Healing Light Yoga Therapy soon. And of course I am drawn to creating some wonderful retreats in vibrant locations around the globe, just need to make the time to create. I am also excited to announce that I have been featured as one of the Top 5 Ayurvedic Practitioners in the Vancouver Area– by Crowd Wellness-Stay tuned to all and everything new that will come. Yoga classes are still held in two beautiful places- Monday evenings are at Yum Yoga Studio in Cowichan Bay, 4:30-6:00. Wednesday’s are in the lovely chapel at Providence Farm, also 4:30-6:00, and as soon as the weather brightens a bit more we will be outside in the meadow.Both spaces are beautiful, and the classes are an opportunity to deepen your relationship with yourself and your body. As always I am offering beautiful and wonderful Bodywork Therapies, so soothing and nurturing, conscious healing, on such deep levels- in a very gentle heart opening space. Consultations, Ayurvedic Counselling, Tarot Readings, and Jyotish Astrology are also available. As are gift certificates for anything that I offer. I want to talk about the freedom of being me. I want to share about the light that exists within us all. I want to offer a reminder on the importance of nature in our lives, and how that nature is just a refection of ourselves. That nature is also a reminder that we are a small piece in a much larger web of life. I want to share about the kindness that is inherent in all of us, and how if we can just turn it towards our own beautiful self, then we can more easily share that love with the world. I want to express the importance of play, of joy in our lives. I want to share all this and more. There is so much to share, so much moving for so many of us. The ways the universe shows itself are countless, and it is different in each of our realitys. Sometimes this movement is light and blissful, and other times it is like banging against a rock wall. However life is blossoming for you right now, it is the right way. The path is clear, even when it feels stuck. Life is not a struggle- it is a movement of energy, just like a leaf falling off a tree- sometimes it softly lands on the ground, and other times its swept away in a whirlwind. Watching the dolphins play in the sea, seeing the manta ray beneath me softly moving towards deeper sea, experiencing the life that is so much bigger than me. It doesn’t matter how fast I move with it, or against it. It doesn’t matter if I struggle and push, or softly accept (well it may be easier if I surrender, or at least more enjoyable), but life continues. My energy flows. My story of me turns the page. What a breath of fresh air this knowledge is. To know that I am always moving, always alive, always bright. That I don’t NEED to struggle, and that i have the choice to react differently, to move more softly, to ride the waves with presence but also joy. That any resistance is held energy, patterns perhaps, or just a mistake of my mind wanting to be in control. It sounds so simple, and it really is. In its beautiful, innate way it is the simplest thing we can do. That doesn’t mean it’s easy. It doesn’t mean that it happens instantly, (it could I suppose). For me it seems to come in waves, and it all comes together when I remember that I am just a small fish in a large sea of life, and that I have the choice, and the willingness to be part of the ocean of life, and to ride the beautiful, sometimes tumultuous adventure of being human. Some things that help me are a daily meditation practice, stepping outside and feeling the natural world, connecting with my loved ones, getting good rest, and reminding myself that I don’t need to hurry. I can intend, I can manifest, I can desire and want, but I don’ t need to move out of force, or fear or anything but joy towards the goals of my heart. It will be there for me- whether it directs me on a long, windy road or a short direct one. If I take my time and look around, either journey can be filled with beauty and connection. In celebrating nature, we celebrate ourselves. Here is a taste of the magic that flows everyday in life- as the dolphins swim and play in Honaunau Hawaii. I have been blessed to swim many times with these magical beings, here is just a taste of the light they share by just being (just like us). Video by Jeffery Fogel. 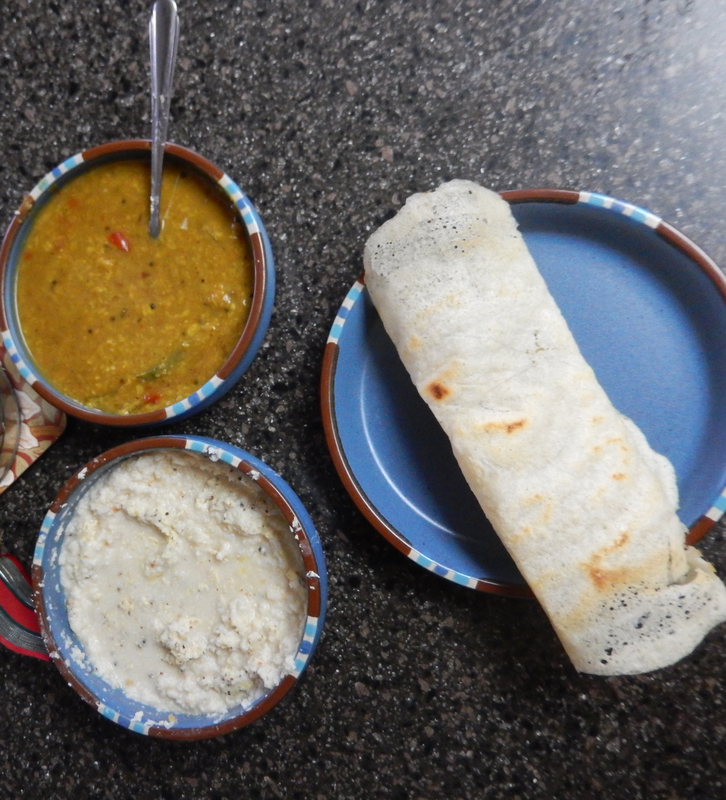 One of my favourite dishes in India is the Dosa. A fermented pancake that is wonderfully easy to make (don’t let all the steps scare you), and tastes so good. In Ayurveda we usually stay away from fermented foods, but this is an exception to that rule. Its often served with sambar (recipe included) and lovely with a coconut chutney. But can be eaten with a regular dal or whatever you like. If you would like a more filling meal you can also put spiced vegetables on the pancake, roll it up and have a masala dosa. 2. In the morning, drain. Combine in a blender or food processor with enough water to make a thick pancake batter. The consistency of the batter should be smooth. Blend in the asafoetida, the fenugreek and the salt. 3. Cover and let sit unrefrigerated, until tiny bubbles form on the surface and the mixture smells sour. In the summer this can happen overnight, in cooler weather it can take up to 36 hours. You will know its worked when it has increased in size and may be lighter and foamier looking. 2. When the surface is almost cooked turn it over and let cook a few more minutes on the other side. 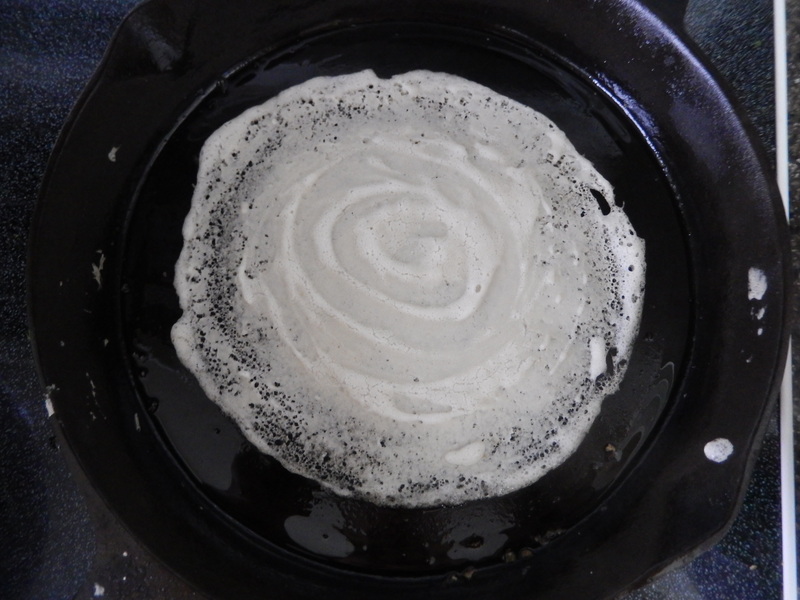 Have fun with this- it may be a thick pancake you come out with, its not always easy to get it just right- but its a tasty treat and with practice and the right temperature skillet easy to make a paper thin dosa. 1. Wash Toor Dal thoroughly. Place in Water and bring to a boil. Cover, reduce the heat and simmer until the dal is tender. 2. Heat oil in a small skillet. Add the urad dal and saute over low heat, stirring frequently until the dal starts to darken. Add the hing, cumin seeds, and mustard seeds and saute until the mustard seeds dance. 3. Add the tomatoes, pepper, turmeric, Sambar Powder, and sugar. Cook, stirring constantly until tomatoes are mushy. 4. Add the spice mix to the dal, add the tamarind mixture. Add salt to taste. Simmer 5-10 minutes for flavours to blend. Stir in the cilantro just before serving. 1. 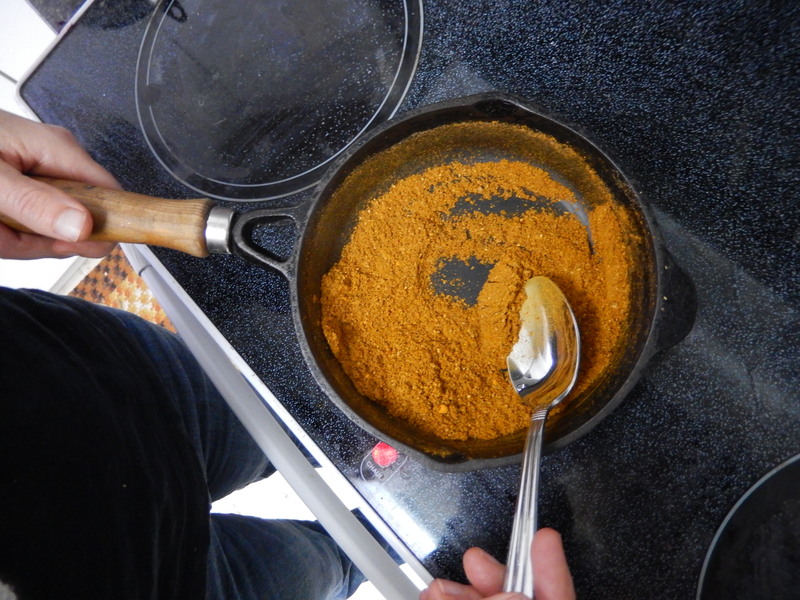 Place all the spices except for the turmeric into a dry skillet. Toast over low heat, stirring constantly until spices become fragrant. 2. Stir in turmeric and remove from heat. Once again just extending my deepest gratitude to you all for taking the time to read this. I wish you all a beautiful and wonderful spring, and encourage you all to take time to feel your own connection to nature, however that may be. Take time to breathe, to look around and to look inside, and to embrace the brilliance of your own part in this amazing world.